Belgium, England, France, Germany, Netherlands, Norway and Spain won Elite Round groups to join hosts Scotland at the UEFA Women’s U-19 Championship finals, with the draw due on 16 April. Germany got the point they needed to take Group 1, Paulina Krumbiegel and Gina-Maria Chmielinski on target in a 2-2 tie with Austria. Czech Republic beat Greece 2-0 to finish second. Both Group 2 matches finished 2-2, meaning that Belgium topped the table marginally ahead of Finland after each match finished dramatically. The Finns had gone ahead on 89 minutes against Switzerland but the Swiss levelled in injury-time, while the Belgians also struck after the 90 minutes were up with Esther Buabadi’s equaliser to hold Poland. Netherlands took Group 3 with a 2-1 result against Iceland, Kirsten van de Westeringh’s effort cancelled out by Alexandra Jóhannsdóttir before Jill Baijings netted the winner. Russia’s Polina Organvoa got the only goal against Bulgaria. 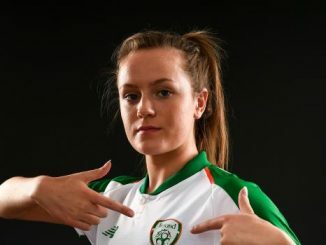 Republic of Ireland missed out on the finals after a 3-0 defeat to Spain, Claudia Pina scoring twice and Aoife Slattery conceding an own-goal. Serbia and Hungary drew the other Group 4 game 1-1. Norway won the Group 5 decider with Denmark 3-0, goals from Jenny Røsholm Olsen, Olaug Tvedten and a Malin Sunde penalty. Northern Ireland twice led through Louise McDaniel and Alex Collighan against Ukraine before going down 4-2, Nicole Kozlova and Nadiia Kunina each bagging a brace. 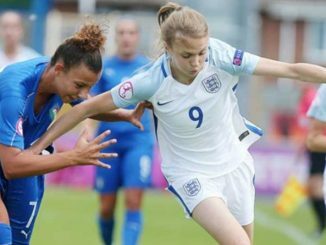 England got off to a great start against Italy, with Jessica Naz and Lauren Hemp striking in the first 9 minutes of the game to top Group 6. The Italians had Angelica Soffia sent off at the end of the first half and Vanessa Panzeri followed her before the hour mark. In the same group, Sweden beat Turkey 3-0 as Cornelia Kapocs scored twice in the opening 10 minutes. France were held to a goalless draw in the top two clash with Slovenia but it was enough to see them win Group 7. Elsewhere, Portugal were 3-0 winners over Slovakia.